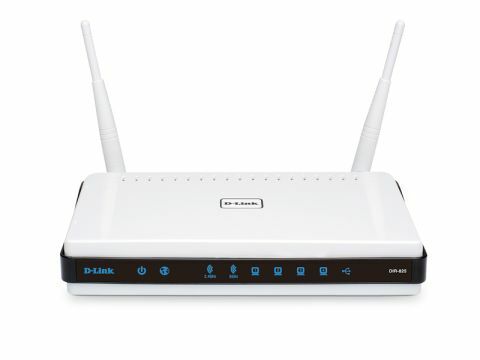 The D-Link DIR-825 is a compact and neat-looking white plastic box with black trim around the middle. The front sports the standard LED lights showing status and which ports are being accessed. On the rear of the unit you'll find two antennae which need to be manually screwed in, so giving you the option of adding high-gain antennae if required. The back of the box has all the usual features, so you will find four Gigabit Ethernet ports for a fixed connection, as well as a broadband internet connection. Interestingly, D-Link has built 'Green Technology' into this router, so any ports that are not in use automatically switch off, along with their respective LED indicator. There is also a USB port for adding a printer or external storage. The latter needs to be set up using the supplied D-Link SharePort utility software. Set-up is a three-step process that requires you to install the software on your laptop before adding the hardware. Installation is wizard-based and sets up the DIR-825 via a web browser. While the settings are comprehensive, they're not that straightforward. Once you've set up the software, you can add the hardware and then set up the security aspects of your router. On the right-hand side of the router is a small Wi-Fi Protected Set-up (WPS) button, which offers one-click encryption between other WPS devices. When it came to performance, we found the signal strength of the DIR-825 to be excellent. Faster throughputs work best on the 5GHz frequency and, once you're accustomed to the software, you can reserve bandwidth for specific tasks. The D-Link DIR-825 is compact and offers solid performance. It may not be the easiest to set up, but once running it works exceedingly well.